Again it was warm last night due to the lower altitude (250 metres) and the heavy overcast. It is about 17ºC when we get up at 8 am. We had planned a very slow start to the day but at 8:15 am it starts to rain. It is not heavy, but it is annoying. It stops and starts. We decide that we might as well leave and as we have a long trip back to Sydney, we figure we might as well leave earlier than planned. While packing up, the brumbies (wild horses) seen last night come down to the river to have a drink. Before leaving, we check out the group camping area (overgrown with long grass and mostly occupied by a portable stockyard for storing the brumbies. The day use area is very nice, but I cannot see that many people would ever use. At 9:10 am we leave the bottom. There has not been enough rain to make the track up slippery. It is low range third and second all the way to the top. It is four kilometres up in which you rise from 250 metres to 900 metres. A short distance from the gate, I spot a huge wedged-tail eagle standing on a side track. As I stop, it flies up into a nearby tree and then further away. Magnificant! We also see some red-tailed black cockatoos near the top of the track. 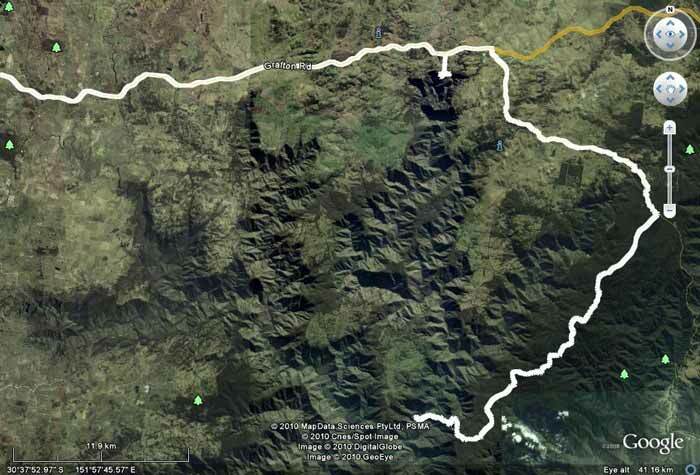 We travel back via Raspberry Road to the Kempsey-Armidale Road which we get to at 10:00 am. Here we saw good-bye to Eric, Jane, Tegan and Drew as they will head back to their home near Kempsey. We turn left towards Armidale. A short distance along we stop at the Styx River. This is a nice gorge with an old timber bridge. We continue on and the turn left onto Waterfall Way (the Armidale-Grafton Road). 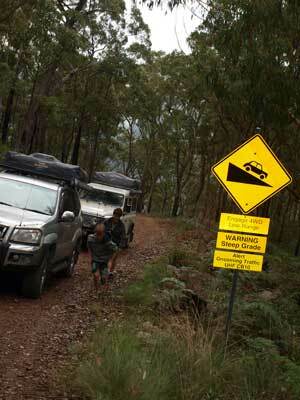 Not far down this road we see a sign to Wollomombi Falls. This is also in Oxley Wild Rivers National Park. It is a few kilometres off the main road. We first go to the main lookout. Here there is a large shelter shed, with barbecues inside and many outside with nice picnic tables. It is a 75 metre walk to the lookout. This has great views back to Wollomombi Falls as well as down into the shear gorge (it must be at least 400 metres to the bottom from the lookout). 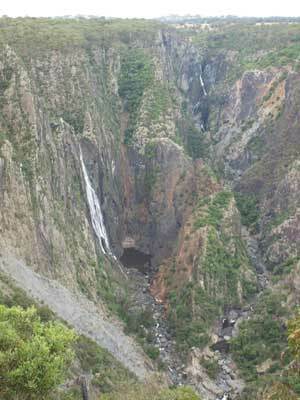 These are the third highest falls in Australia, the Wollomombi River dropping 260 metres. To the right of these falls are the smaller Chandler Falls. This is where the Chandler River drops from the plateau into the same gorge. This river is of course the one we were camped at this morning. There are some nice walking tracks here to other lookouts. We do not have time to do them as it is already obvious we are not going to get home till well after dark. 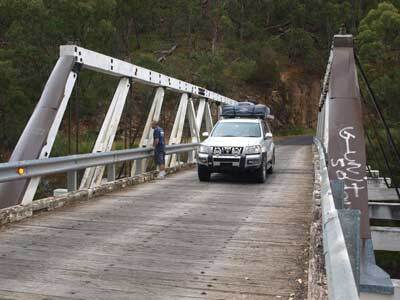 We drive to another lookout, Edgars, which has views over a different section of the gorge. It also has a barbecue and table. 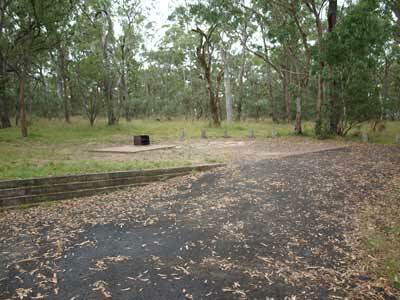 We then go to the Green Gully Camping Area. This is within easy walking distance of the lookouts. It has about a dozen flat sites, although each site can only take one vehicle/tent. There are timber barbecues, toilet and water. It looks quite nice, we will have to come back and stay here on another trip. We are back on the road at 11 am. Fifteen minutes later we pass the road to Long Point which is also in Oxley Wild Rivers National Park and has a camping area. At 11:30 am we stop at Armidale and have morning tea in a cafe. It is drizzling slightly. We depart at noon and just outside town join the New England Highway. We continue towards Tamworth where we arrive at 1:30 pm. I need to put some fuel in to make it home. A bit south of Tamworth, we stop at a truck stop area and have lunch. We leave at 2:15 pm and continue along the highway via Scone, Muswellbrook, Singleton and Maitland. We then cut across to the Pacific Highway/F3 and head back to Sydney. We have a pretty good run, with no delays. We arrive back home at 7:45 pm. While there was a section of this trip that you could not do without the access to the private property gate (day 4), the rest could be done by everyone. Even a fair bit of the trip could be done in a two wheel drive (virtually all of days 1 to 4). We saw some amazing wilderness, with a few historic items as well. An excellent shorter break. There is still a lot more to do in this area, you could easily spend a couple of weeks alone in the area bounded by Kempsey, Wauchope, Walcha and Armidale. highly recommended.